Global Affairs Canada director general Sara Wilshaw (second from right) discusses the federal government's strategy for helping Canadian entrepreneurs break into the international market at the Dell Women's Entrepreneur Network Summit during the week of July 15, 2018 in Toronto. TORONTO – Toronto is number nine in a list of fifty cities around the world evaluated for their friendliness to women entrepreneurs by the 2017 Women Entrepreneur Cities Index (WE Cities) study conducted for Dell by IHS Markit. The study, presented at the Dell Women’s Entrepreneur Network (DWEN) Summit last week in Toronto, looked at 72 factors, 45 of which have a gender-based component, to provide a rating and a profile of each city. Toronto scored 46.0 points of 100, just ahead of Seattle; the number one city, New York City, received 62.9 points. 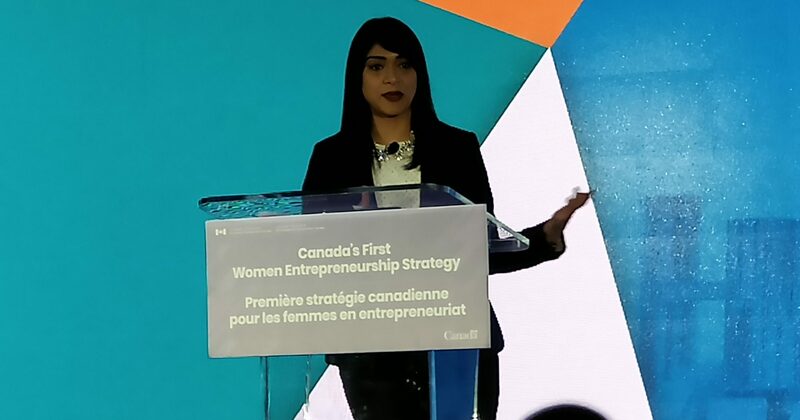 The report cited as positives the ease of starting a business in Toronto, the frequency of city events for women entrepreneurs, the city’s online portal offering guidance for starting a business, the presence of city and national policy advocacy for women’s equality issues, and its fair pay policy, as well as a number of national programs for women entrepreneurs. Recommendations for improvement included the need for implementation of policies to give women equal footing in accessing capital, policies giving women more access to opportunities in procurement, and publicizing and encouraging accomplished women to serve as role models. During her keynote, Dell Chief Customer Officer Karen Quintos (above) told attendees that the DWEN Summit was in Canada this year because the country is vocal in its advocacy for gender equality. More than 100 women from 16 countries attended the event, including entrepreneurs, legal and trade experts, investors, and representatives of regional consulates from as far away as Singapore, for two days of sessions on all facets of building and growing a business. A separate Girls Track set twenty teens on the task of thinking through creating a business that would help alleviate the problem of waste plastic ending up in the ocean, which is a passion at Dell. The Federal government’s strategy will be about giving a hand up, she said, working with the Business Development Bank of Canada (BDC) to provide access to capital, to the tune of $1.4 billion over three years, and helping with the administrative burden by simplifying the application process. In addition, $10 million has been allocated over five years to connect women with expanded export services. During the international trade roundtable, Sara Wilshaw, director general, North America, at Global Affairs Canada, elaborated. CanExport, she said is a co-funding initiative to help Canadian small and medium businesses access new export markets by matching their marketing investments dollar for dollar. It’s one of several programs from multiple agencies. She also noted that the government is looking at ways it can help businesses access e-commerce platforms like Amazon and Alibaba to showcase Canadian products.